When you require additional care, it can be difficult to find the best place to meet your needs. Individuals who need assistance in maintaining their daily living while recovering from health issues can benefit from the care provided by many facilities. The need for additional care is typically a result of aging or undergoing some hospitalization. Relocating can be overwhelming, so choosing the right place is essential to your long-term wellbeing and comfort. Many individuals who require additional care need assistance in various personal tasks. These include bathing and getting dressed. Getting out of bed and feeding can also become difficult over time. Many care facilities provide the assistance to maintain these and other activities. They can also provide the appropriate level of medical care when needed. Skilled healthcare personnel may be on staff to administer different treatments depending on the individual. Some facilities may have a licensed physician on hand to provide supervision over the care of all residents. The process of finding the best place of care to fit your needs isn’t always easy. For family members, it can be a process that includes emotions such as anger and sadness. Also, loved ones must consider the potential costs associated with care facilities and the medical needs that must be met. 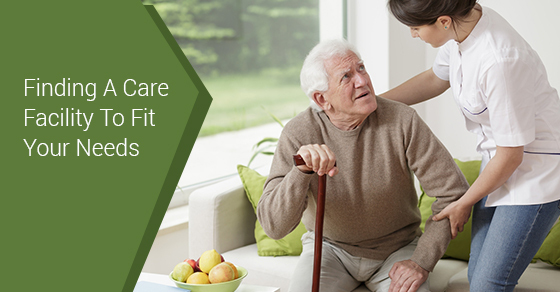 Individuals who are planning on moving to a care facility should undergo a health assessment to identify their unique needs. This helps to determine what types of facilities would be ideal. In addition, individuals who are at risk of experiencing falls due to mobility or health issues may benefit from a care facility. If 24-hour supervision is required, a facility and its staff can ensure a high level of safety. An individual’s family and friends can provide support and care. But if the need for additional care arises, they may need to consider a care facility. There are a number of ways you can locate the ideal place of care to fit your needs. Your physician and other medical practitioners can recommend different options for you to choose from. In addition, friends and family members with previous experience in finding care facilities can also provide additional insight into which facilities might be best for you. There are many resources online to help you find a facility in your area. These resources may provide details on the types of services and quality of care that is offered. Each facility will have a greater level of experience in working with a given population. Some specialize in working with Alzheimer’s, while others may be better suited for individuals who are recovering from strokes. You should take the time to visit different facilities to get a better idea of the services and quality of care they provide. Observe the residents in order to get a sense of their level of activity and socialization. Finding the best place of care to fit your needs can be easy when you know what steps to take. Understanding your needs and determining which facilities offer the level of care you’re looking for will help you determine the best options.